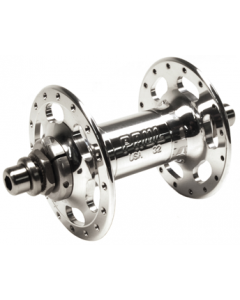 This front hub with a funny name does everything a reliable and serviceable front hub should do and more. It spins very smoothly due to specially machined bearing bores and high quality precision sealed cartridge bearings. The axle is turned from high-strength 7075 aluminum, and is available in bolt-on and quick-release versions. The Quick-Release FHUB is very light weight; this makes it easy to remove a front wheel when fixing a flat or mounting your bike to a roof rack. FHUBS with bolt-on axles provide greater theft resistance and give a stiffer connection to the fork.